This giveaway is now closed. Stay tuned for the winner announcement. Thank you all for entering! Spoonful of Comfort is offering our readers a giveaway of a care package containing 64 oz. of award winning, all-natural chicken noodle soup (serves 4-6) along with 6 made-from-scratch rolls and 6 oatmeal raisin cookies, a $46 value. On a cool Thursday in March, I was feeling under the weather and the kids were bugging me for dinner. I hadn’t taken out the meat and was considering throwing together peanut butter sandwiches when the doorbell rang. It was the FedEx man with a heavy package which contained . . . soup. Not just any soup, but home-made, mailed directly to your door chicken noodle soup from Spoonful of Comfort. When Marti Wymer’s mother was diagnosed with lung cancer, she wanted to do something to help her mom. The idea of sending chicken soup, the quintessential comfort food, to loved ones in needs of some loving care, was born. Today, you can order her homemade chicken noodle soup, (along with optional rolls, cookies, socks and a “little pick me up”) to be sent to someone you love who is sick, facing a medical crisis or just needs a little love. In memory of her mother, a portion of the proceeds from each sale will go to chairty. Our 64 ounces of chicken noodle soup arrived in a large glass jar with a cheerful yellow ribbon. It was nestled between two cold gel packs, wrapped in foil bubble wrap and sealed with the company’s sticker. The box also contained six white-bread rolls and six oatmeal raisin cookies, all with the cheery yellow polka dot ribbon adorning the packaging. Crinkled brown paper kept everything safe and nothing, not even the cookies, showed the slightest bit of damage. The soup, which is ready to eat, was still cold. The “wrapping” of this homey package was a piece of scrapbook paper (shown in the background in the pictures) with a large note card on top. You can personalize the inside of the note card for no additional charge. Simple instructions (refrigerate immediately and heat and eat within 2-3 days) were enclosed. The packaging was very attractive and cheerful. I thought the yellow ribbons and scrapbook “wrapping” paper were a nice touch and would make a nice keepsake for a recipient who likes to scrapbook. You could easily reuse the paper and ribbons in a variety of projects and the majority of the packaging was recyclable. I will admit that I was a little leery of fresh soup being mailed to me. I thought it had to be freeze-dried or chock-full of salt and preservatives. It is none of these. It is indeed fresh soup and it was cold enough, and sealed tightly enough, that I had no qualms about feeding it to my family. The soup had large chunks of all white meat chicken and thick noodles. The broth was pale yellow and I could clearly make out the carrots, celery and onions, which were diced so fine that my 11-month-old could safely eat them. Everyone loved the noddles; they are thick, chewy and taste very much like fresh, homemade noodles. The chicken looked like it had been hand-shredded from a roast; it was definitely not processed chicken parts. My husband had one complaint: not enough salt. In one way, this is good. 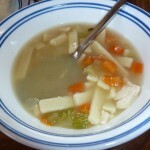 This soup is intended to be sent to people who are sick and, thus, need something light and easy on the stomach. It also allows you to add your own salt, to taste. Our order also came with six white rolls. The rolls were wrapped in a plain plastic bag tied with a twisty-tie and, of course, the yellow ribbon. They are made with white flour and were light and fluffy, perfect for soaking up the broth and gentle on a “sore” tummy. They broke apart easily so you could spread jam, jelly, butter or the comfort spread of your choice on them. My husband gobbled up two of these rolls before he ate the soup! I do think the rolls would be good for people who need light, easy to eat and digest foods- which is what the product is intended for. For us, who were not terribly sick, they were not very filling. 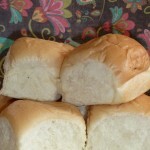 However, I can imagine someone with a cold or flu lying on a couch, nibbling on these rolls and feeling better. We also got a half dozen of homemade oatmeal raisin cookies. The cookies were sweet and light. They were pretty moist and broke apart easily to share. They would be a nice, light treat for someone who is sick and can’t tolerate “heavy” foods. Sixty-four ounces of homemade soup is mailed to a person of your choice for only thirty-four dollars. Six rolls and six oatmeal raisin cookies are available for an additional six dollars an item. If you chose to send a complete meal (soup, rolls and cookies), it would cost 46 dollars before shipping. You would probably need to send a gift card to a family restaurant worth 40-50 dollars to feed a family of six people. Considering this service offers a homemade, nourishing meal directly to their door, it is comparable in price, if not a better deal. However, only 64 ounces is available. While this is great for a family facing a medical crisis, with a new baby or just one with multiple people, it can be a lot of soup for one person. I’m not sure a college student living in a dorm would be able to store the large jar or eat enough of it before it went bad. I can understand that offering one size probably makes the cooking, packaging and shipping process easy and streamlined, but it would be nice to see a variety of sizes offered. The rolls were great, but I would have liked to have seen some allergy information on the packaging or on the website. They are obviously made with wheat, but I would have liked to know if they had egg, milk or soy in them as I have a child who had to avoid eggs when he was younger. If you chose to send rolls with your package and want to know if they may contain an allergen, I would contact customer service. We all, especially my daughter, loved the oatmeal raisin cookies. They were sweet, chewy and full of raisins. 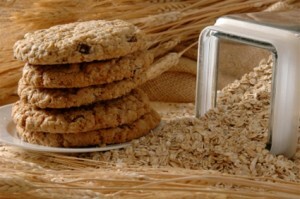 Of course, for a breastfeeding mom, oatmeal raisin is the perfect cookie to send! However, only one type of cookie is available. Six dollars for six reasonably-sized cookies is a fair price but, again, I would have liked to see a variety of cookies offered. Chocolate chip seems to be a popular and well-received cookie, as are plain sugar cookies. As with the rolls, I would have liked to have seen allergy information on the package. I asked the Herd who they thought would like this soup. They all responded, “Great-Grandma!” I agree! Their great-grandmother lives alone and doesn’t like to cook for one person. She would love getting a fresh meal in the mail and chicken soup is something we could feel good about sending her. We have friends whose five-year-old daughter is undergoing cancer treatments and more friends facing a long NICU stay with their new baby. Both families have multiple children and are dividing their time between home and hospital. 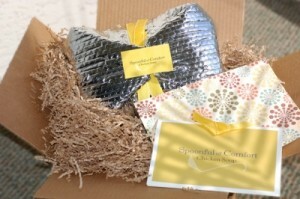 While the aforementioned gift card would be nice, a package from “Spoonful of Comfort” would be even nicer. The food is fresh, healthy and kid-friendly. The meal would come to them instead of having to coordinate “car side-to-go,” a huge bonus for a family who already has enough on their plate. If you use “Spoonful of Comfort,” I urge you to let your loved one know that a package is arriving. The food inside is fresh and although everything was still cold and safe to eat, it should not sit out in the sun all day. If you know they might not be home, you may want their neighbors to accept the package for them. Overall, this is a great product that you can feel good about sending. The packaging is attractive, fun and can be personalized. A portion of the proceeds goes towards a reputable charity in memory of the person who inspired the business. The food is fresh and tasty, even if the size selection is limited. It’s definitely a service I would use for friends and family! Want “A Spoonful of Comfort” for yourself? You can easily purchase soup care packages online at SpoonfulofComfort.com and have it delivered to your loved ones in refrigerated packaging. Chicken soup is $34 for 64 ounces (serves 4-6). One half-dozen made-from-scratch rolls or oatmeal raisin cookies adds $6 each. You can include a couple other pampering extras, as well as a gift message. Speedy shipping in the United States by FedEx (Monday-Friday) is included in the price. These soup care packages would make a wonderful gift for a friend or loved one recovering from surgery or illness, getting used to a new baby, away from home, or unable to cook. It’s like sending a family meal through the mail! 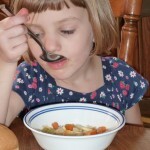 For your own chance to win a Spoonful of Comfort chicken soup care package (containing 64 oz. of award winning, all-natural chicken noodle soup along with 6 made-from-scratch rolls and 6 oatmeal raisin cookies), enter in the comments below! Contest is open to U.S. only. Head over to SpoonfulofComfort.com and tell us something you’ve learned! Tell us your family traditions for comforting the sick (1 entry), and email your response to Spoonful of Comfort for 1 additional entry. Like Spoonful of Comfort on Facebook. Post this giveaway on your Facebook page or wall and leave the link (1 entry). You can use this status update: Send a gift of comfort! 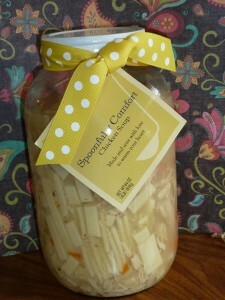 Enter to win a @Spoonful of Comfort soup care package from @Natural Parents Network. Contest ends April 14 and is open to US. Follow @ComfortSoup on Twitter and leave your Twitter name in the comment. Subscribe to Walden Mommy in a reader or by email, or follow on Google Friend Connect (1 entry for each). Leave a relevant comment on a non-review article at Walden Mommy and tell us which post (comment on separate posts for up to 3 entries total). Add http://waldenmommyandfamily.blogspot.com/ to your text blogroll for 2 extra entries. Leave your site URL in the comment. Contest open to United States mailing addresses only (sorry, international readers — no soup for you!). Contest closes April 14 at 11:59 p.m. PDT. Disclosure: Our reviewer received a soup care package for review. 1. I didn’t realize that there was scientific research done to prove that chicken noodle soup helps you feel better! 2. Maybe it’s a bit selfish, but I’d love to have it for myself. I’m trying to stock up on lots of healthy, yummy foods in my freezer & pantry for the weeks after my baby comes this August. I know I’m not going to want to cook at all! 4. I like NPN on FB! 5. I subscribe to NPN in Google Reader. I learned that chicken soup can inhibit inflammation of the cells in the nasal passage which reduces the symptoms of a cold! The care package would probably be for my husband, daughter, and I! We’ve gotten so many colds this year, (my daughter has one now!) that this package would be perfect! A recent tradition that my husband and I have begun when we get sick is to take a hot bath with Jordan Essentials Dead Sea bath salts. Nothing sounds better than a hot bath when we’re down with a cold. I like Spoonful of Comfort on facebook as Hannah Rae. I like natural parents network on facebook as Hannah Rae. I follow ComfortSoup on twitter as hgardner16. I follow natparnet on twitter as hgardner16. I subscribe to natural parent network by email. I follow Walden Mommy via gfc as hrhersch. 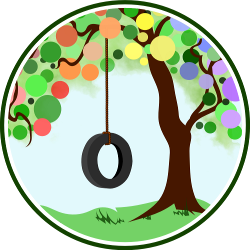 I added your badge to my blog. I entered the Glad Rag giveaway. I commented on Ten Tips to Relieve Toddler Carseat Woes.